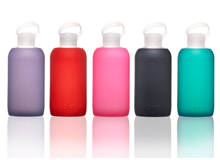 Props to the ladies at bkr for creating a glass bottle with functional silicone sleeve that one may use to drink all sorts of beverages from without looking as though embarking on a journey that requires carabiners. 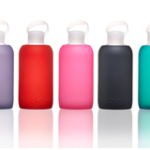 The bottles are BPA-free, BPA-replacement free and phthalate-free. $28 is less than a case of Fiji and you can be stylish drinking water from this continent. Best part is the founders are recovering lawyers too. Très chic. This entry was posted in Baby and tagged bkr, bottle, BPA, bttl, drink, phthalate, silicone, water by Baby Gone Green. Bookmark the permalink.